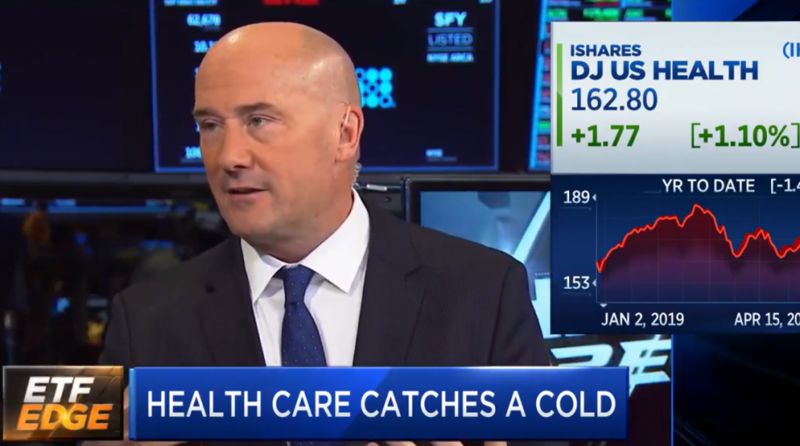 You are at:Home»Equity ETF Channel»Tom Lydon on CNBC: Can Health Care Cure Itself? Uncertainty and skepticism are a cause of sickness in the tried-and-true health care sector, which has been the worst performer in the S&P 500 in 2019–up a paltry 3.8 percent compared to the broader index’s 16 percent. Can the typically-reliable health care eventually cure itself? Putting the sector under the microscope reveals two trends–middling performance for conventional health care, but astounding gains for biotechnology. The biotech space has been fueled by a spate of mergers as of late, including Bristol-Myers Squibb offering $74 billion to take over Celgene–a deal that could allow Bristol to become a top five pharmaceutical giant. In addition, Eli Lilly offered $8 billion to purchase Loxo Oncology. One ETF to take advantage of the latter is the iShares Nasdaq Biotechnology ETF (NasdaqGM: IBB). IBB seeks to track the investment results of the NASDAQ Biotechnology Index, which contains securities of companies listed on NASDAQ that are classified according to the Industry Classification Benchmark as either biotechnology or pharmaceuticals and that also meet other eligibility criteria determined by Nasdaq, Inc.
A Giant Headache Coming for Health care ETFs? One vital sign for investors’ taste of health care ETFs will be the release of first-quarter earnings from Johnson and Johnson (JNJ) as well as UnitedHealth Group (UNH)–two giants in not only their industries, but with respect to weightings in the largest health-related ETFs. The same can be said for UnitedHealth Group. While health care has been relatively unloved by investors as of late, the sector doesn’t reveal weakness in terms of hiring. The Labor Department recently reported better-than-expected payrolls to bring the three-month average to a strong 180,000 jobs created per month–that number is lower than the 223,000 jobs created in 2018, but falls in line with a robust labor market.